Janet and I are fortunate in that we live in a car-free park in Amsterdam. Though we live in a suburb close to gorgeous rural Amsterdam, we’re not far away from downtown. To get there we can take a bus to Central Station, using the IJ tunnel. Or we take a bus (a bike-ride or a walk) to nearby NDSM — a former shipyard — and cross the IJ river by ferry to the station. The IJ is a body of water without which Amsterdam would not have grown into the city it is. Though Amsterdam is named after a Dam in the river Amstel, the IJ (a digraph pronounced pretty much like ay or eye) made it possible for traders to reach the growing village — way back when — and thus for the city to become a center of trade. We love to visit various spots along the IJ, where we take walks, have picnics, or enjoy some coffee and something to eat at places like Bbrood (bakery/coffee & teahouse) or Al Ponte (an Italian-style kiosk run by Italians and serving Amsterdam’s best coffee along with fantastic sandwiches). 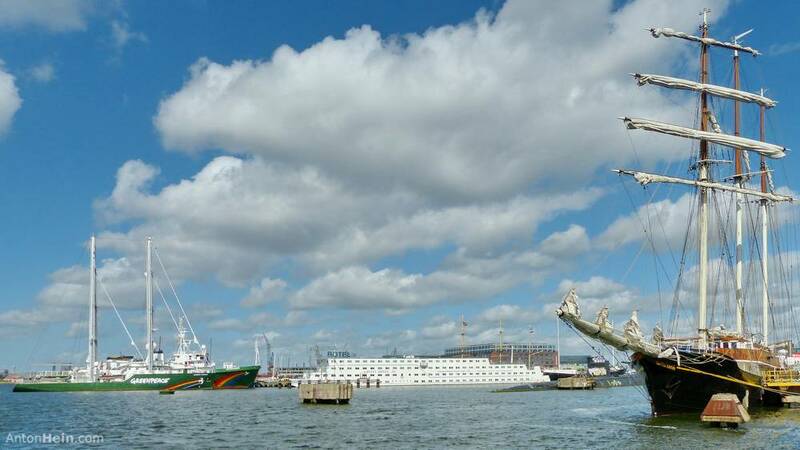 A collection of old ships are moored at NDSM — including a Soviet Zulu class B-80 submarine, a former marine training ship currently in use as a restaurant, a lighthouse vessel, a pirate radio ship, the Greenpeace vessel Sirius, and various other ships. In July 2014 Greenpeace International moved its HQ here, occupying part of the NDSM’s former forge. 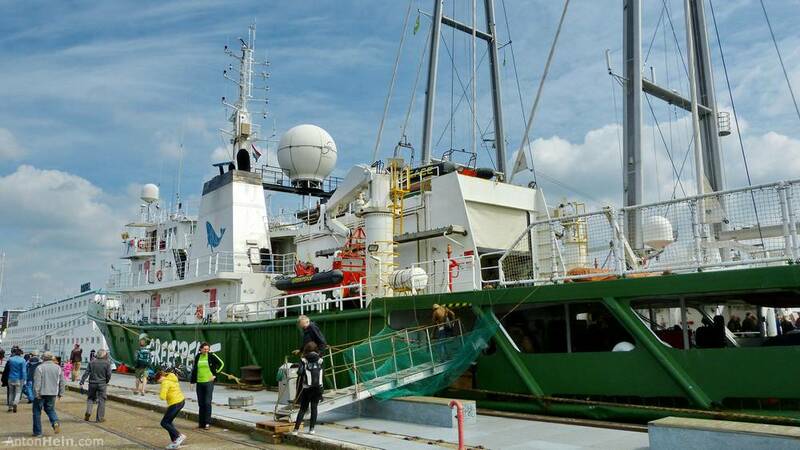 Amsterdam is the Port of Registry for the Greenpeace ships, which include the Sirius (retired), the Rainbow Warrior, the Esperanza (formerly used as a firefighting ship by the Russian navy), and the Arctic Sunrise (stolen by Russia). The Sirius is used in educational projects. 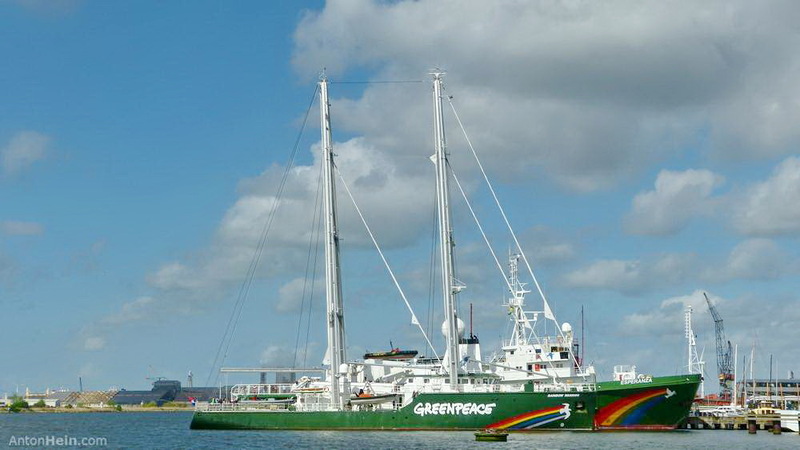 Currently it has been moved elsewhere while two Greenpeace ships — the purpose-built Rainbow Warrior and the Esperanza — are visiting at NDSM.